Blast chilling gof the products allows the maintenance of most of the moisture contained in the food and avoids the formation of macrocrystals, retaining the organoleptic properties of the food. Schock freezing allows for reaching a core temperature of -18ºC in less than 4 hours for the product's optimal preservation. In both cases, we use a Blast Chiller.. Retention of the organoleptic properties of the product. Purchase of raw product in low-price and/or high-quality season. Half-prepared food always ready for regeneration. Double function: blast chilling + schock freezing. Indirect air flush: low product dehydration. Conic-shaped core probe: easy to extract. Hard chilling function for thick products. Preservation with automatic defrost: longtime preservation. Hot gas defrosting:very fast and effective. Pre-chilling function: costless chilling process. 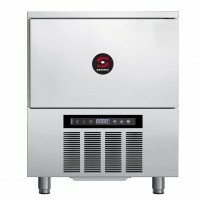 Get to know our range of Blast Chillers & Shock Freezers. We offer a wide range in different sizes, both for trays and trollews: the ideal solution for each need.